This is the second post in a series on learning to edit non-destructively in photoshop. Last week we covered the basics of why you should learn to use non-destructive editing techniques in photoshop. The first tool that we went over was the non-destructive crop tool. Today we will cover layer masks, one of the most integral and powerful features in photoshop. For beginners, layer masks can seem a little confusing and intimidating. Don't worry, masks are not as complicated as they seem. A layer mask is simply a way to hide part of a photoshop layer. Just think of a layer mask like a literal ski mask that you would wear on your face. You don't want your eyes and mouth to be covered, because you want to be able to see and breath. A layer mask can do the same thing, where it allows certain areas of the layer to be visible while the rest of the layer remains hidden. How to use a layer mask. It's easiest to understand how to use layer masks by jumping right in. Go ahead two images in photoshop. Drag one image into the other file so that you have two layers in one file. 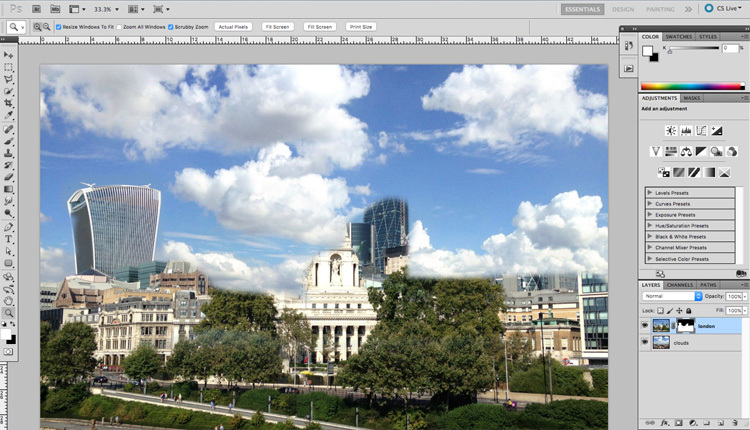 I chose a photo of London and a picture with some nice clouds that I could mask into the sky behind the buildings. Select the top layer and click the little icon of a circle inside a rectangle. This will add a layer mask to the selected layer. You won't notice a difference at first because layer masks are filled with white by default. White means 'visible'. However you'll notice a little box appears next to the layer icon in your layer palette. This is your layer mask preview and it will update live, as you edit your mask. Click on the Brush tool in your tool palette or hit B on your keyboard. Now press D to make sure default (black and white) colors are set for your foreground and background colors. One of the first keyboard shortcuts you should master when starting to use layers Photoshop is simply hitting X to switch between your foreground and background color. This will be an invaluable time saver as you work with masks. Switch your foreground color to black. Click on the layer mask preview icon. Besure that the layer mask icon is selected and not the layer itself. You don't want to mistakenly paint over the image data of your layer. Now just start painting on your canvas. You'll notice that wherever you paint black, the layer disappears and the bottom layer starts to show through. If you paint over an area that you didn't intend to hide, just press X to switch to white and repaint the area that you want to reveal. You can see that did this to uncover the parts of the buildings that I masked away by mistake. Layer masks are infinitely editable in this way, unlike trying to achieve this same effect using the eraser tool. You can keep tweaking, zooming, and perfecting your mask until it is just right. You don't have to worry about making a permanent mistake. That covers the basics of layer masks in Photoshop. After you've gotten used to the concept, you can start to apply more advanced techniques. You can create selections with any selection tool and then fill that area of the mask with black/white. You can apply gradients to a layer mask. Layer masks can even be used to fine-tune the effects of adjustment layers. As you can see, layer masks are an extremely valuable and powerful tool in Photoshop. Once you adopt masks into your workflow, I promise you will never look back.